January 9. 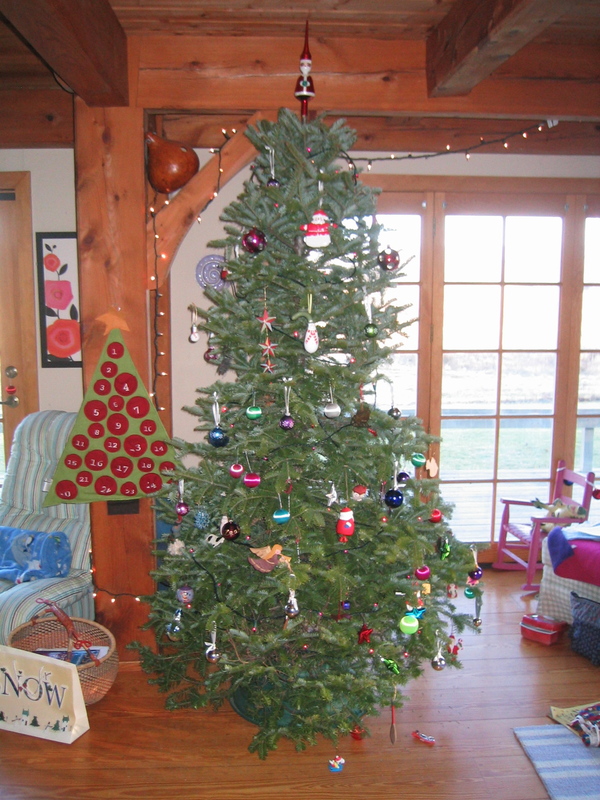 The Christmas tree is still standing. Decorated no less. That’s 42 days it has been indoors. Dead no less. It will come down this weekend, tomorrow or the next day. So it will get at least 43 days of glory, dressed in the best we could offer–shiny glass and steel and plastic. But it will be a fire hazard soon, if it ever wasn’t one. Now we will have a little more space in the house. And we will use a little less electricity. But it has been nice to have around. Maybe we can put something else in its place. A basket of fruit? A cardboard cutout of Chewbacca? A bean bag chair? Maybe a pile of attractive rocks? Nah. Let’s just get this thing out of here. Come spring it will fertilize the blueberries. 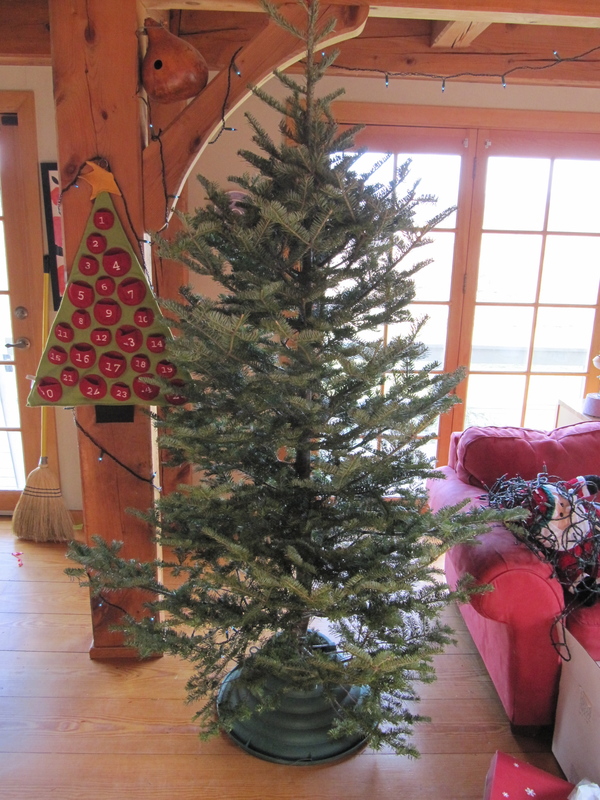 No need to waste a perfectly good untrimmed Christmas tree, no? The Saturday after Thanksgiving is the day we have gotten our Christmas tree in the past and we continued that tradition today. We cut our own from Martel’s farm in Williston. The place has an incredible view of the Green Mountains, Lake Iroquois and the town of Williston, so it is worth the trip just for that. We got some help tying to the top of the car and drove slowly home. 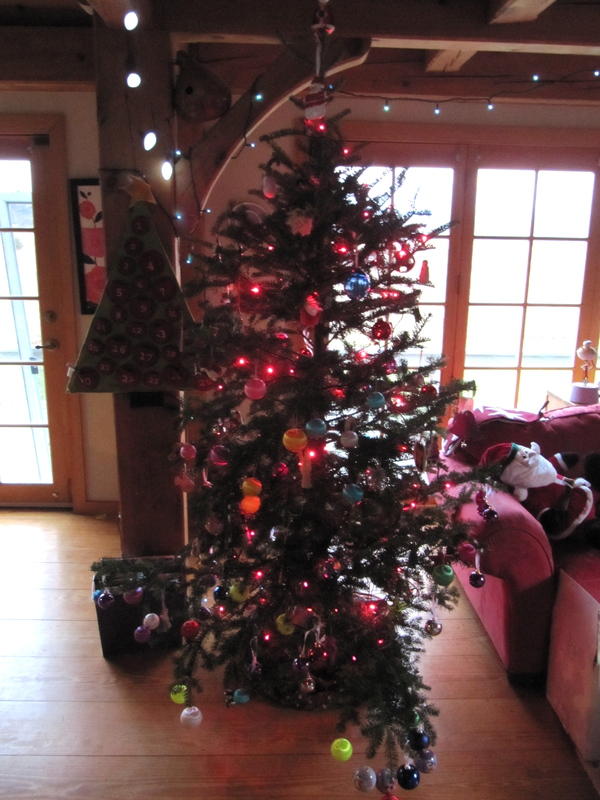 This tree is tall and skinny, unlike the rotund jobbers of the past two years. It is a long boy. We stood it up and trimmed it this afternoon. Christmas has arrived. In a few days we start the advent calendars. Now we just need some snow. And it looks like tomorrow we will get some. Snow day on Monday? We inherited an old apple tree when we moved into this house. The previous owner told us that it never bore fruit. It blossomed each spring but no apples appeared. The first fall we were here, a couple of years ago, I pruned that baby good. I cut lots of wood from it and, behold, we had apples the next year. We had a lot of apples this fall. Too many, in fact. I haven’t gotten the equipment to make applesauce or cider or to can what I might make. Part of the challenge is that apples are Red Delicious. They are tasty, but they do not ripen until October. Maybe in September we will get a few, but we have a narrow window between ripe and hard frost to get to them. It just doesn’t happen as well as I’d like. Recently, I was listening to The Splendid Table, a program on Vermont Public Radio. The hosts were talking about apples, since this is the season, and they dissed the Red Delicious. Granted, I would agree with them if they were referring to the mushy and sort-of sweet Red Delicious that gets piled up in supermarkets and whose silhouette has become the symbol of appleness. But the apples on our tree (once they finally get ripe) are way sweeter and juicier than those sad pretenders. I was sorry to hear them put down a variety in its entirety. Those fruitists! We have a flock of wild turkeys that like to hang around here. These days they can be found late in the day and early in the morning, those crepuscular hours when the light is muted, bobbing about under the apple tree, poking at the drops. They have gotten a few meals there. I don’t begrudge them, especially when they snack on the mealy ones taken over by worms. They can have those. Plus, those ugly drops keep them from flapping into the branches and taking the good ones. 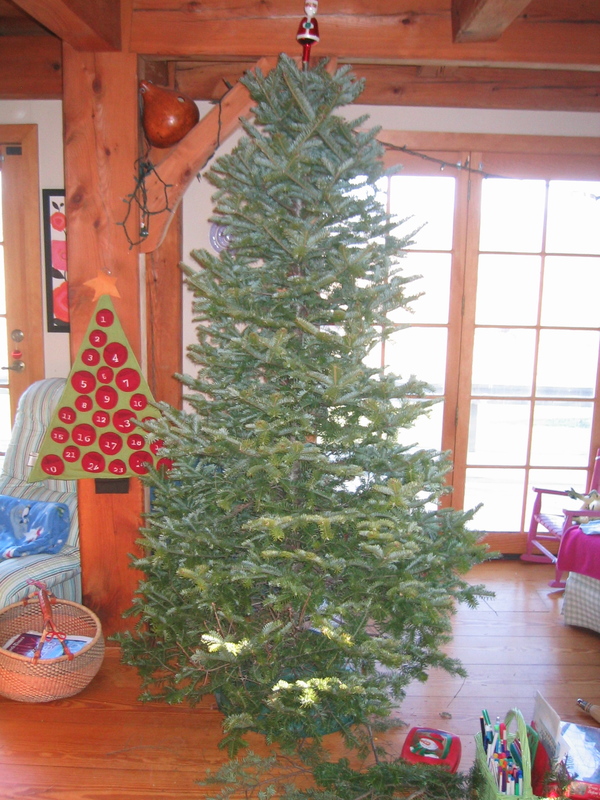 I will take some time to prune the tree this fall or perhaps in the first days of spring. We will get more apples next spring I am sure. What I need to do is plant a couple more trees, give us some species variety, as well as an earlier crop. It would be nice to count on having some apples in September. And we should get our hands in a cider press, have a good old fashioned cider pressing party. That would make those late apples, even the ones that might not offer their full flavor, well worth it. I don’t care what reputation Red Delicious may have.